Welcome to Triangle Eye Institute now part of MyEyeDr. O.D. Our Brier Creek office is now open and accepting new patients. Dedicated to providing quality services in an unhurried and caring environment. Thank you for trusting Triangle Eye Institute with your vision care. As of May 30, 2014 our eye care practice is now affiliated with MyEyeDr. O.D. You will continue to see your trusted, community doctors just with a new name. We’re proud to announce our new affiliation with MyEyeDr. O.D., the region’s fastest growing vision care company, because they share our commitment to personal service and providing patients with the finest professional vision care. 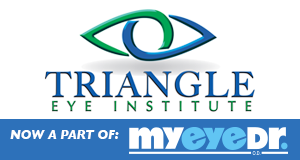 Triangle Eye Institute now part of MyEyeDr. O.D is your local trusted Optometry practice offering comprehensive eye exams, contact lens fittings, ophthalmology surgical eye care and low vision rehabilitation. Our offices are conveniently located in the heart of the RTP serving Raleigh, Cary, Morrisville and Apex, North Carolina. We carry top contact lens brands including Acuvue, Bausch & Lomb, Biomedics, Encore Toric, Focus, Frequency, O2 Optix, SofLens and PureVision. Our vast selection of eyeglasses by top designer brand names includes Gucci, Armani, Ralph Lauren, Ray-Ban, Prada and Fendi.